Maurits Cornelis Escher was Dutch; born on June 17, 1898 and died on 27 March 1972, normally known as M.S Escher. He was a graphic artist who is reputed for his mathematically driven woodcuts, mezzotints and lithographs. Through his mathematically affiliated work, he exhibited ideas of infinity, architecture and tessellations. His dominant field of profession included drawing and print making. He was born in Leeuwarden, Netherlands. His father was a civil engineer, George Arnold Escher and his mother was Sara Gleichman. He went to primary and secondary school in Arnhem since the family moved there. Escher went to a special school at seven years of age, and he also failed the second grade. But his drawings were particularly good despite his poor grades. He practiced carpentry and piano lessons till the age of thirteen, and in 1919 he went to the Haarlem School of Architecture and Decorative Arts. Over there he studied architecture for a short period of time, however due to a skin infection which was a persisting distraction he switched to decorative arts. His study mentor was Samuel Jessurun Mesquita and he supervised his studies, Escher was friends with him for years to come. When he left school by 1922, he was already experienced in drawing and making woodcuts. Maurits Escher traveled to Italy and Spain; eventually this led to his appreciation for the Italian countryside and Moorish Castle in Granada, Spain. Alhambra had a great impact on his work since they incorporated mathematical formulas with repetitive patterns in stone walls and ceilings. He also visited Italy on a regular basis after his initial encounter with the country. He married Jetta Umiker in 1924 whom he met in Italy. 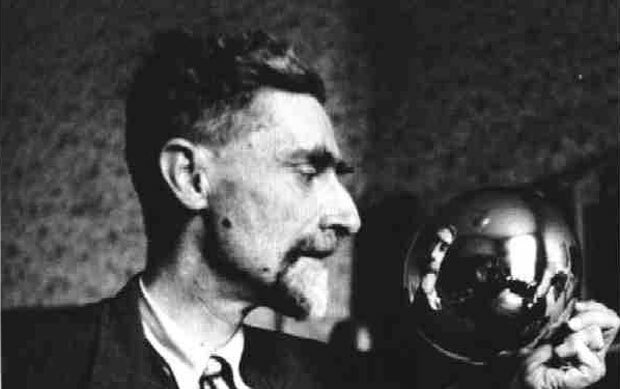 They lived in Rome, and their son Giorgio Arnaldo Escher was born. The political situation in Italy got unbearable for him, so they decided to leave and moved to Switzerland. However Switzerland’s landscapes didn’t impress him as much as Italy, hence the family moved to Belgium. But then again their residential status fluctuated due to World War 2 and they moved to Netherlands. This allowed him to focus a great deal on his work which was only given a break during 1962 when he was surgically operated. In 1970 he moved to a retirement home for artists, over here he had his own studio. His work is mathematically highlighted because his drawings also included those around “impossible objects”, for instance the Necker cube and the Penrose triangle. Polyhedra and geometric manifestations have attracted many scientists and mathematicians to his work; his work “Gravity” is quite well-known since it features a stellated dodecahedron. His wrote his first paper titled “Regular division of the plane with asymmetric congruent polygons” (1941), comprising the mathematical understandings which were meant to be integrated with his art work. He also published a book in 1958 titled “Regular Division of the Plane”. This was also proof of mathematical concepts being meshed into artistic talent. In conclusion, Maurits Escher was quite a prominent mathematical artist since he managed to bring two different disciplines into one personal edition of work.